Collisions with other vehicles are one of the scariest types of accidents a motorcycle rider can face. The rider’s exposed nature when compared to the occupants of the vehicle, along with the much greater mass of the vehicle versus the motorcycle means that these accidents often result in serious injury for the rider. Motorcyclists know that wearing a helmet is critical to ensuring that the rider’s head is protected in the event of an accident. Helmets will help prevent the head from directly striking the pavement or the other vehicle in the event of an accident, which in turn should limit the damage that can occur from head trauma. According to research published by the National Institutes of Health, riders who wore helmets during accidents were admitted to the Intensive Care Unit (ICU) in 25 percent of accidents, whereas riders who did not wear helmets were admitted to the ICU in 36 percent of accident. However, helmets do not completely protect them brain, and to make matters worse, the brain injury may not present outward symptoms until well after the accident, making it incredibly important that the injury is identified early on. If you have been involved in a motorcycle accident, one of the first things to do is to examine your helmet. Look for scratches or cracks. Those indicate that some other object contacted your helmet, whether you realized it at the time or not. If there are indications that something struck your head, allow yourself to be examined by the paramedics at the scene, if they are called. If they paramedics suggest that you go to the hospital for a full evaluation, allow them to take you. If they are not called, it would be wise to schedule a time to see your doctor just for a checkup. However, if you notice that you are sleepy, you have headache or that your vision is blurred, these could be signs of a brain injury, and you should seek medical attention immediately to ensure that the symptoms are not a sign of catastrophic injury that could lead to death. Even if there are no signs that your head was struck by another object, be aware of any changes you may notice. Concussions can occur even when there is no contact with the head. The quick change in direction that occurs during an accident can cause the brain to strike the inside of the skull, leading to a concussion or worse. Severe brain injuries can lead to lifelong decreases in functional ability, whether cognitively or physically. These injuries can lead to loss of wages, long-term reduction in earning capacity, and lifelong medical expenses. It is impossible to know when a brain injury will have these outcomes. What is possible is to ensure that your rights are protected and that you are compensated as fully as possible for injuries and damage you suffered. Did you or a loved one sustain serious injuries due to a motorcycle accident in New Jersey? Don’t let the medical bills pile up while you wait for the negligent party or their insurance company to do the right thing. Right now, you need an aggressive personal injury attorney on your side, fighting to get you the compensation you need, want, and deserve. 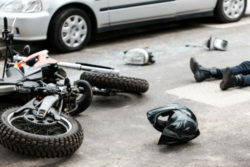 The skilled attorneys at the Law Offices of Richard A. Stoloff represent clients injured because of motorcycle accidents in Egg Harbor, Pleasantville, Galloway Township, Hamilton, and throughout New Jersey. Contact us at (609) 601-2233 or email us to schedule a consultation about your case. We have an office conveniently located at 605 New Road, 1st Floor, Linwood, NJ 08221, as well as offices in Philadelphia, Pennsylvania.